One of my tasks for Exodus Place involved creating newsletters and email updates. Here is the June Newsletter I wrote and helped design! We wanted a short 5-minutes maximum read so that subscribers could get a small snippet of the wonderful updates at Exodus Place in their inbox. If they wanted additional information, we included an option to visit our website for more stories. I also am finishing up the July Newsletter. Here’s the draft so far. 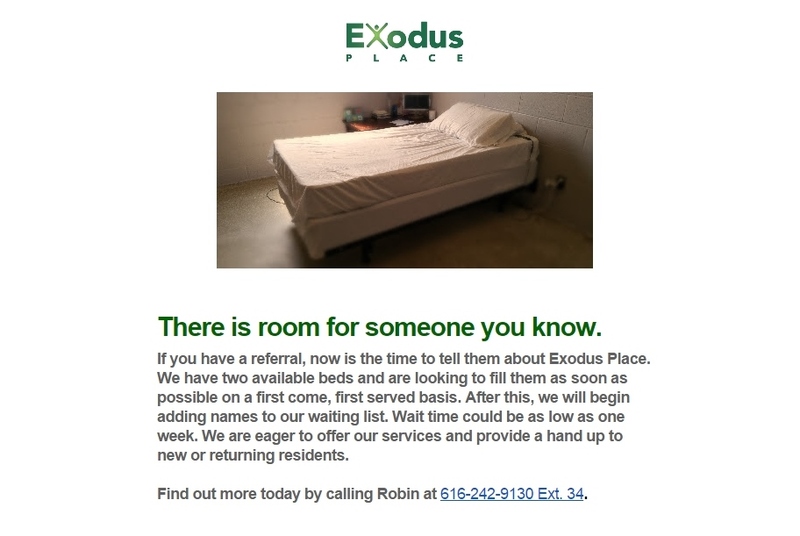 Every two weeks, Exodus Place sends an email to partner agencies and nonprofit organizations to inform them of residential room availability in the facility. Here is an example of one of these emails I created.